Manya Basile has spent the last 25 years as a fine art and antique appraiser in Washington DC, New York, Chicago and Michigan. 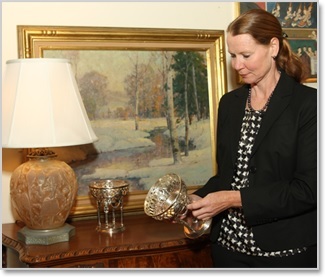 Her firm Personal Property Appraisals, based in Birmingham, Michigan, specializes in fine and decorative arts, including paintings, prints, sculpture, antique and contemporary furniture, silver, porcelain, pottery, glass, textiles, Asian objects and collectibles. Formerly she served as the Director of Decorative Arts at C.G. Sloan and Company in Washington, DC, Director of Furniture and Decorative Arts at Leslie Hindman Auctioneers, and also ran an independent appraisal firm in Chicago. Personal Property Appraisals completes over 100 insurance, estate, and charitable contribution appraisals each year. Our clients include private individuals, corporations, museums, estate attorneys and banks. Ms. Basile is an accredited member of The International Society of Appraisers. She is a current certified USPAP Appraiser, and tested and passed the Uniform Standards of Professional Appraisal Practice. Ms. Basile lectures on the history of decorative arts and has contributed to national publications. She wrote a column for the Pioneer Press, a division of Chicago Sun-Times, has been a frequent contributor to Art and Antiques Magazine and Chicago Magazine. In addition, she acted as a contributing expert and appeared regularly on two cable network television series, At the Auction and The Appraisal Fair. She has also appeared as a guest on the ABC Nightly News and the Antiques Roadshow.